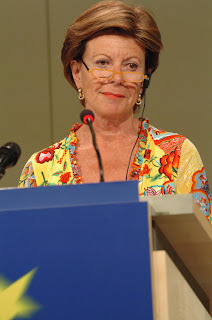 When Neelie Kroes was the commissioner for competition of the EU, it was an expensive experience for Microsoft. Now that she is the commissioner for digital agenda of the EU it may even become a devastating experience. When you read this speech of her, it is clear that the days of the dominance of proprietary standards in the EU government are coming to an end. When businesses are to communicate with the EU they will have to conform to open standards. When Microsoft products do not provide such compliance, businesses will have no choice but to look for software that does. Are you sure she's doing a great job? What about this article? It was a revolution that time. Now other Indian states are seeking the help of Kerala to study about moving to Free Software. if you google you can see many other links. Siebrand the lanquadrature article is speculation about what might be in a policy text that is not available yet. As such it is very much FUD.